Six months from now many of us will be menu planning. Or mapping out the mother of all shopping experiences. Or listing things we are thankful for. Planning holiday gatherings and wondering if it’s a good time to start shopping for Christmas. This is not one of those “y’all get ready, Christmas is so many days away” posts. This is quite different actually. We are six months from the start of the holiday season. Inevitably hearts and minds, reflecting what they are thankful for, will turn to those who have less. Those who are in need. Without enough food. Without shelter. Without a home. Many people reach out and offer their resources and time to those agencies and people whose mission it is to feed the hungry and support the people who are homeless. Which is absolutely wonderful. And resources wisely invested. Unfortunately, these missions and folks helping people in need are in desperate need of these resources all year long. While we hate to think of folks being out in the cold of winter with no place to go, imagine not being able to escape the oppressive heat, or the torrential thunderstorms, or the incessant attack of gnats and mosquitoes. I once met a woman who had been living by the river to escape some of the worst of the heat. She came to the meal that we all shared on Sunday nights covered in mosquito bites. It was heartbreaking that something like a can of bug spray would have made all the difference in the world for her. Something that would have been cheaper than a pair of gloves and a hat in the cold of winter, but just as important for survival. So this is not a “Hey Christmas is coming–feel the pressure–and dread it already.” This is a reminder to drop by your local shelter with those travel soaps and shampoos. Take a few cans of bug spray with you. Or call the soup kitchen and offer help with a meal. 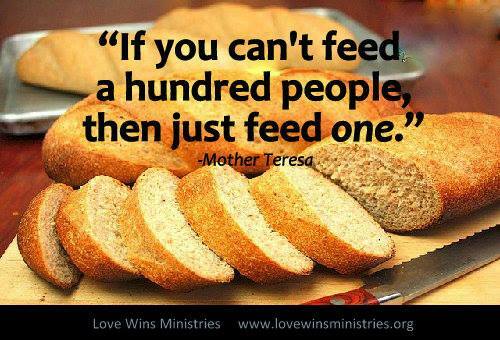 Everyone loves the idea of serving the Thanksgiving or Christmas dinner, but folks need feeding all year long. Maybe check and see if a program in your community helps provide food on the weekends for children who are on the free meal program at school. The school year is coming to a close, and these littles ones will be home…..and hungry…..more than they have been all year. There are as many needs that need attending to as there are people in our world. My point is not to make anyone feel guilty or to tell folks what they need to do. We can get both of those from any number of other places–we don’t need to make each other feel bad. My point is–the need is always there. If you felt moved to help at Thanksgiving or Christmas, please think about helping out now. Right now is when the giving to these helping agencies goes way down. Your help is needed more than ever. Let’s all make tomorrow a day to help another. With our gifts, talents, and resources. Giving and sharing never go out of season. If you don’t know where to start in helping folks, here are a few places to start. You can do a search for your own local agencies. Again, this list is just a start and by no means exhaustive of all the great folks who are helping others. If you have any to add, please do in the comments so we can all learn more about these missions. Thanks. The phone rang last Friday. Actually it chirped. Like a cricket. I guess phones really don’t ring anymore, do they? It looked like a local call but I didn’t recognize the number. I was relieved when I heard Mac’s voice. He hadn’t been at Daybreak when I was there for Sister Circle the previous Tuesday, and I hadn’t heard from him since the week before. I had been worried. “Hey, where are you? This is a new number. You borrowing someone’s phone?” I asked. Oh NO. What had happened this time? He’d been having some bad falls due to his balance not being good, even stone cold sober. “You are.” I paused. “Ummm, that’s good. Really good. What brought this on?” Last I knew he was thinking about it, but he didn’t seem in a big hurry to make it happen. Ah. Sprinkling. *shrugging* Whatever it takes. He was in good spirits. He was dreaming again. About where to go after detoxing. About what he could do with his life. He wants to work, he wants to get a job–a real job. One that he CAN do, despite his balance issues. My heart soared. As he talked, I bowed my head and said a silent word of “thanks.” And I was grinning really big. Over the weekend we talked a couple of times. He was in the zone. He was attending meetings and eating good cooked food and sleeping in air conditioning and on a real mattress. For the first time in ten months. All because of his choices. On Monday, while I was in the middle of dealing with Mr. A.A. Law, Mac called me again. Mac was going back “home.” The place three hours to the northeast, where he lived for about a year–minus the two weeks he spent in town here because he took a drink and then many more on his visit back home for Thanksgiving. When he went back for a second chance and then did not return, after a visit back to town last July, he was told that was it. And fair enough, right? There are consequences to one’s actions. And that was it. The beautiful thing about this change of heart by Mr. J is that it’s because of one thing. Mac has called Mr. J off and on over the last few months when he’s been at Daybreak, the day shelter in town. From what Mac has shared, I gather they’ve visited, caught up on folks who were there when Mac was and those who still are. I believe that those conversations, the thoughts and struggles shared through the phone line–that’s why Mr. J is willing to take a chance with Mac again. He’s heard what I’ve heard. That, for now, in this moment, Mac is ready. I don’t kid myself, y’all. I’ve done it before. Been all happy, happy, happy–saying Oh THIS is the time. THIS time he is going to make it. Now I dream and hope smaller. Today this is it. In this moment he’s making good choices. One moment at a time–that’s the true journey for an addict–no, wait–for all of us, isn’t it? I spent a lot of Wednesday and much of yesterday trying to find a kind soul to drive Mac up to his new/old home today–his discharge date. I found myself getting frustrated. Frustrated that I couldn’t do it without getting out of prior obligations. Mad that no one seemed to be able to make the trip. Whether lack of dependable transportation, scheduling conflicts, or whatever–no one was able to do it. I was feeling lost and very sad, and a little like no one could sense what a special person he is and that taking him and getting to know him on this trip would be more rewarding than anything else. And then as messages from friends I’d asked for help from came pouring in, I saw the opportunity–the possibility for really good things that was coming from this–from me not finding someone right away. Friends were regretful that they couldn’t do it, but they would be praying. Friends wanting to support him however they could. Folks who wanted to write him, send him encouragement. People who have never met this man, reaching out, lifting him up, taking his journey and making it important in their hearts and thoughts. Folks were looking to give comfort and refuge any way they could–folks were “being the feathers” for Mac, and it made me cry. Tonight I’m thankful for the young man who did step up and agree to drive a complete stranger in his vehicle for over three hours. He was the epitome of Kindness and Compassion. You might know this young man–look up those words in the dictionary–I’ll bet his picture is there beside both of them. He smiled and looked down at his shoes when I asked him to let me know when he’d made it home safely. “It’s been a long time since I’ve had to do that with anyone,” he said. “I’m a Mama, indulge me, please,” I smiled back. And so he did. Journey there and back–safe and sound. Thankful for that. And so much more. I give thanks for the change in how I saw things–that moment when I shifted from being frustrated to amazed–realizing that even though this friend or that friend couldn’t drive Mac, they were lifting him up–that was a freeing moment. It gave me pause, and I was quiet and felt the hush of my anxious spirit almost immediately as the realization hit. People care. They really do. And then they do what they can with that caring spirit. he’s not coming back to town. This town that he has called home most of his life–he realizes he can’t come back, for that is where temptation to take a drink with old buddies is the strongest. He’s sad about that–he loves his Mama and will miss her. She loves him too, and she says she will visit him when she can. Fingers crossed for that too. As you think about Mac tonight, tomorrow, next week, please let’s also think about relationships. I love my brother. I will write and be here to talk when he calls. But it’s not the same as seeing him each week. Being a friendly face for each other in the midst of all the other faces that might not be quite as friendly. I am hopeful that someone in town there will feel moved to reach out. He needs a friend, one who understands, is supportive, and loves him outside of the programs and the steps and just loves him as is. Someone who will visit him and take him out once or twice a month. Someone he can trust and call friend there, in his new town. He needs to be known. I think that will be a huge part in how this goes this time around. But I’m trying not to let worry take over. As I learned yesterday, if I do what I can do, and then sit back and wait, good can come. There was a young man here who put Other ahead of himself and did a great thing today; I am sure there is a feather there who will land with his arms around my brother right where he is now. We just have to wait. It occurred to me yesterday after my visit with Mac that it has been about two years since he took the first step on his journey to recovery. Once again. It began with a long ride after being released from prison in Macon to a town about three hours away, to a beautiful rehabilitation facility where he made good choices and friends and dreamed dreams again. But this story began a few months before. He had turned himself in to an officer that had stopped by the gas station store that he frequented. I think that had been in January. He was tired of running, tired of that way of living, and he knew there were warrants out for him for probation violation. Probation for things like panhandling, loitering, you know–the major crimes. Anyway, turning himself in got him a bed and three meals a day. And had me worried he wasn’t showing up on Sundays until I saw his name on the sheriff’s website. We started writing letters back and forth. I loved hearing his stories and dreams and the jokes he liked to tell. In those letters we got to know each other pretty well. He knew the way my littles preferred play over learning, that I loved to bake better than cook, and that the Fella loves old classic cars. He sent notes and drawings to all of us, and we sent back pictures he could draw, stories to read, and letters sharing the ins and outs of our days. And then, in one letter, he mentioned the visiting hours. And asked if I could come. I had never been to prison before. I wanted to see this man whom I grew to call my brother. I wanted to give him all the support he needed to make wise choices once he took that first step out of his cell as a free man. He needed a good network of folks to walk with him, and I intended to be one of those folks. But prison? At the risk of being redundant, Wow. As it turns out, different folks are assigned different visiting hours. His was 1 p.m. on Sunday, along with several others. He had to put my name and anyone else who might come on a list. If you weren’t on the list, you weren’t getting in. We decided that I would visit on this one particular Sunday, barring anything unforeseen happening. All of this was communicated by letters, so there was a lot of room for miscommunication or total lack of. That Sunday morning I got up, took care of the tea and coffee for the park’s Sunday night supper, and got ready to go. What does one wear to visit prison? A strange question, I know, but I was second guessing EVERYTHING. I chose regular, casual clothes and worried over the shoes. I had heard something about not wearing open-toed shoes, but I wasn’t sure. I wore my flip flops and carried Aub’s boat shoes with me just in case. I drove to downtown and found the tree-lined street on the back side of the jail where I’d be entering. I parked the car on the street, and checked my clock. 12:45. I was early. I sat and took it all in for a few minutes. Normal looking brick building with the exception of the painful looking wires at the top of the fence. And across the street? A convenience store with “Lottery, Beer, Cigarettes” painted on the side. Oh y’all, I nearly cried. If Mac were released with no one to pick him up, I could be fairly certain that’s where he’d head. After all, there was a phone outside there, if it even worked. And the nearly three months of detoxing and not drinking he’d done would all be for naught. My heart broke, and I knew something had to be done. How many leave that facility with no one to go home to and find themselves over at that store? Its location was no coincidence, I felt sure. I approached an officer who, it was obvious, was bored and didn’t have any warm fuzzies about folks coming to visit folks they cared about. She looked on the card–the one that had my name and Mac’s Mama’s name and one other on it. I almost wanted his Mama to come, so I could meet her and maybe there wouldn’t be a lull in the conversation. Because it occurred to me–this would be the first time we’d talk in person with him sober. At 1 p.m. on the dot, I was told which window to go to. There were stools of sorts in front of the windows, but someone had blocked the bottom half of the window so you couldn’t see your friend unless you were standing up. There was a phone to pick up and speak into and that was how we were to communicate. After a couple of minutes of standing there, I saw a group of men in orange jumpsuits heading towards us. I scanned the group, and there he was. He grinned that grin of his, and I grinned back. It was good to see him. He had showered and looked well fed and well rested. I was thankful. He picked up the phone, and said hello. Ah. Only I couldn’t hear him. I spoke and looked at him questioningly. He shrugged and shook his head. He nodded at the window two spots down. Someone had come in, said two words to their person and left from that window. I looked around for someone, anyone, to ask if that was okay. Because let me tell you this. If there is a place where one does not want to do ANYTHING wrong or upset ANYONE or cross ANY lines, it would be in prison. They wouldn’t have far to haul me if they decided they didn’t like what I was doing. Seriously. I was worried. But Mac had already moved down. Why wasn’t there an officer supervising this? What was I going to say–He made me do it? After a moment of hesitation, I moved down and picked up the phone. We could hear each other. Finally. Eventually I relaxed a little, once it became apparent no one cared that we had changed windows. We visited and caught up from our latest letters. He told me about his attorney visiting the day before. About how sometimes he didn’t want to go to the meals, just wanted to rest. I asked about him working on his novel, a western, and he said, no not right now. Maybe later on he would. We passed the time with stories and jokes and I can say for sure, an hour is a long time, when you are speaking into a phone and trying to find a comfortable way to lean/stand and staring through “glass” that has something running through it that makes focusing on the person on the other side really hard. I loved the visit but as we hit the forty-five and fifty minute mark, I could tell that Mac was getting tired. He has never had good balance, even stone cold sober, so this was wearing him out too. We talked for a few more minutes and then said our goodbyes, with promises of writing and wishes for safety and good health. I gathered my license and keys and thanked the bored officer and headed out into the fresh air of that overcast Sunday. As I walked down the street to my car, free to drink the water in my own cup waiting for me in the vehicle I owned, I felt like I had a fresh pair of glasses to see through. I had only spent an hour inside the facility, but it was enough to make me see and appreciate things a little differently. As I left him yesterday, I felt a push to give him two numbers I had in my purse in the car. Two numbers of possible rehabilitation or transitional places. I sat in the driver’s seat and copied them down. When I walked back around to the opening in the gate, he had left his seat outside. I went in and looked around. I hoped I could find him. And there he was. In the technology room. He came out when he saw me. He was quiet for a second. “I’m almost there.” He nodded and looked at the paper again. “I am. I called Joe the other day.” Joe, who had run the transitional home he’d been in until last July. Tonight I’m thankful for this life that takes me outside my comfort zones and into places where I have to step up and love someone else. It’s not easy, and I’m not always a willing participant. But when I go, the rewards are phenomenal. I meet folks whom I would never have met otherwise–people who bring richness and laughter into my life and stories that touch my heart. I am thankful for the folks who raised me to listen and love all–it’s not easy but they set a good example to follow. And a tough one. And tonight I ask for us all to keep Mac and all of our brothers and sisters like him in our thoughts, prayers, hearts, and minds. The ones who need someone to see them and hear them and love them through choices, good and bad. And when it comes down to it, isn’t that what we all need? I got to see my friend Mac today. He looks really good. He seemed sober and well-rested. I give thanks for that. It can’t be easy to get good rest when you don’t know exactly how cold it’s going to get or if your tent will hold during the next rain or if a policeman or someone else is going to come and make you move along. We had time to sit and visit today–a rare gift. He shared the discouraging news he had about something that could have changed his future. We shook our heads, and I asked him what he was going to do. He shrugged and said, “What I need to do.” And I laughed and said, “You’re going to do what comes next.” He nodded. Today I listened to Mac’s game plan, his “what comes next,” I was proud of him. Proud that he had done his own research and asked questions and had come up with a plan. This is huge. We sat and talked about Aub and the littles. How they were all doing and the propensity for two out of the three of them to lose textbooks and pencils and socks. Then he shared a story with me. My jaw hit the floor. She asked him WHAT?! Can you imagine being asked to be an example to a young person of who not to be? How not to turn out? What was this woman thinking? I understand the frustrations and challenges of raising children. I know what it feels like to worry over their choices and their actions and their friends and what they are doing every hour of every day. I don’t know exactly what this woman was having to deal with, but what I do know is this. Mac is a human being. They are more than the sum of where they live or how they live or when they had their last meal and where it came from. They are stories of families and choices and choices taken away. Of lost jobs and injuries and friends who took advantage of them. They are people who need the same basic things we all do–to feel loved and respected and valued simply for who we are. Not to be asked to be an example of a life gone wrong. On any given day, we fluctuate where we live, how we live. All of us live on a continuum. None of us are completely on either side of it. 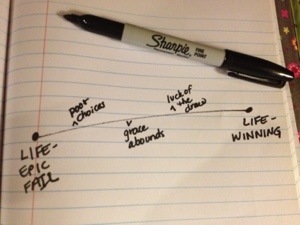 We all float somewhere in the middle–about where poor choices, luck of the draw, and grace abounds all meet. My friend was seen as a two-dimensional character–“what not to become”, not as the beautiful person he is. Not all people who are overweight have a problem saying no to food. Not all people with lung cancer smoked all of their lives. Not all people who are out of work failed to apply themselves and get an education. Not all people who are homeless are lazy and don’t have any ambition or dreams. People should not be defined by their circumstances. If we don’t know their stories, we shouldn’t assume the reason why their situation is as it is. What this lady was asking my friend and the others to do was to scare her son into behaving. We don’t ask this of other folks–what is it about not having a roof over their heads makes my friends any less human? Mac laughed it off. He’s used to shrugging off the insensitivities and downright rudeness (my words) of folks. He sees it a lot. And he didn’t mind telling the young man to stay in school and behave. He tells my children the same thing quite often–that and to keep up with their textbooks. Ahem. The difference here is I didn’t ask him to, but the biggest difference is we have a relationship. I know some of his story and he knows some of mine. The reason he says this to my children is because he KNOWS them, he knows how they roll, and that they’d rather be playing on the hill at Daybreak than doing math any day. And because they love him, they listen to what he says. He doesn’t finish out his sentence about staying in school and behaving with “or you’ll end up like me” because that would make no sense to them–all they see is a wonderful guy, “Uncle Mac,” who fell into our lives and became my brother–a friend who makes them laugh and who draws great pictures. He makes all efforts to be sober when he’s around them, and for that I give thanks. Because we are close, he knows that is very important to me. He wants sobriety. He wants to have a home, friends, family he can be with anytime he decides to go see them. He has tasted it and it tasted pretty good to him. But the taste of the alcohol is stronger. And for now, it’s winning. But I have hope. This beautiful soul, this talented artist, and this quick-witted friend and poet–he has a lot going for him. And when he makes the decision to do something different, I’ll be right there beside him. His choices don’t affect my love for him. They only affect my worry for my friend, my brother. We all need to know we matter, that someone cares for us. As a person, not as a cause or an example or a lesson. As a living, breathing child born into this crazy, messed up world and left to eke out a life for ourselves. Without an instruction manual. We all need to know we are human. And that others see that in us. And we all need to be careful of the lens we use when we look at other people. Go love somebody and let them know how much they matter. It’s a good day for that…..any day, don’t you think?